Plastics, and PVC in particular, have become one of the most widely used materials in offices, households and buildings, playing a vital role in our everyday life. In sports, flexible PVC is particularly important and can be found in many different applications. Its cost efficiency, durability and light weight make it ideal for roofs and flooring in permanent and temporary sports venues but also in a large variety of sporting goods. Plasticisers make PVC bendable and soft in order to withstand considerable physical stress without breaking and, at the same time, offering an endless array of aesthetic and creative possibilities. And when it’s time to replace it, flexible PVC can be reused and recycled into new applications. Olympic Games always require extensive construction work for the host city. 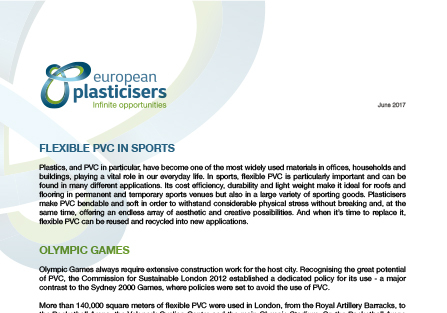 Recognising the great potential of PVC, the Commission for Sustainable London 2012 established a dedicated policy for its use - a major contrast to the Sydney 2000 Games, where policies were set to avoid the use of PVC. More than 140,000 square meters of flexible PVC were used in London, from the Royal Artillery Barracks, to the Basketball Arena, the Velopark Cycling Centre and the main Olympic Stadium. On the Basketball Arena alone, about 20,000 square meters of patterned recyclable white PVC wrap was used, making it one of the largest temporary venues ever built. 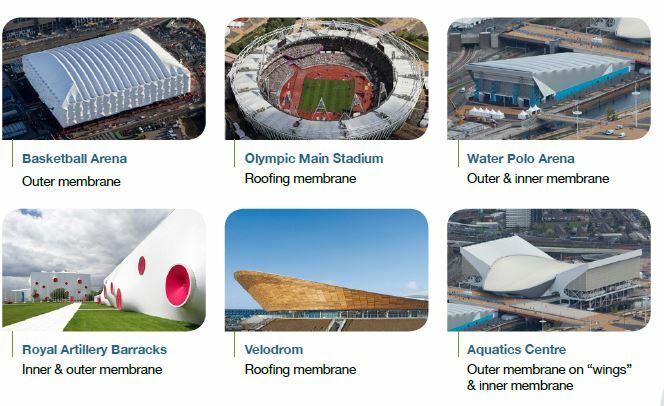 Its easy-to-install structure made from a steel frame and a membrane, made this one of the Olympic venues with the quickest construction schedules. Parts of the Basketball Arena and other temporary structures were being reused at the next Olympic Games in Rio, the FIFA World Cup 2014 and other major sporting events. The FIFA World Cup 2014 was hosted in 12 different Brazilian cities where 7 stadiums were newly built and 5 renovated, most of them using virgin and recycled PVC extensively. For example, the petal-shaped roof of the Arena das Dunas in Natal was completely coated with PVC on one side. The Arena Pantanal, which replaced the Stadium Governador José Fragelli in Cuiabá, used a fire-resistant PVC membrane on the inside as well as a waterproof PVC membrane on the outside of its roof. PVC membranes were chosen as part of an airy architecture making use of natural light and cross ventilation to save energy. The PVC membrane adds to the modern look of the stadium while protecting the spectators from harsh sunlight. Besides stadiums and large venues, flexible PVC applications are essential for a wide range of amateur and professional sports. Plasticised PVC can be found in tennis nets, in the floors of gyms and playgrounds, in balls, bags and mats, boxing gloves, clothing, footwear, etc. The list is endless. Its versatility, its unbeatable cost-efficiency ratio as well as its low maintenance requirements have made it a widespread material for decades in all kinds of sports; and indeed we can watch these sports from the comfort of our living rooms thanks to the flexible PVC used in the cables that make television broadcasting possible.